In today’s world, anyone could build their own website.. but it doesn’t mean that you should. With websites like Wix and Squarespace people are jumping onboard to create websites for their business. So why hire us? 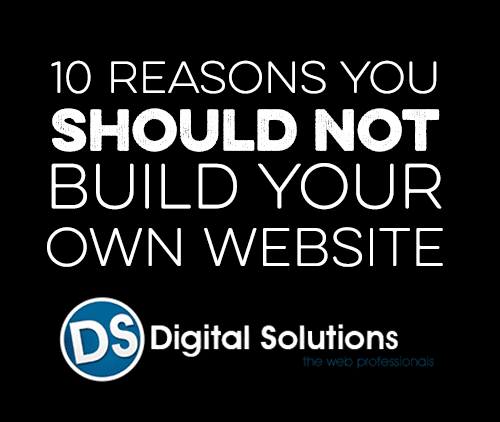 We came across a wonderful blog post by Chris Hughes that gives “10 Reasons you should NOT build your own website“. We here at Digital Solutions could not agree more. We hope that after reading this, you consider hiring us professionals to take care of it for you. This is your brand. Let us help make it GREAT. The following blog post was Written by Chris Hughes. Click here to see the original post. “Some people think it’s easy to build a website. There are many website developer tools available that allow you to drag and drop pictures, and insert wording. Keep in mind that that these tools use templates that are generic, and not specifically designed to meet your business needs. Web development requires behind the scenes coding that’s done by skilled web developers. There are plenty of DIY projects that you can tackle yourself; Here are 10 reasons why building your business’s website should not be one of them. We all know what SEO means but do you know how to set it up? SEO allows exposure of your website to potential clients which is crucial for business. Your website needs to be appealing to search engines like Google. Google does not crawl DIY sites; they’re too busy ranking optimized pages.